I feel like I write an awful lot about our household’s world of hygiene; however, in the world of zero waste, it seems to come up a lot. So here goes. I ran out of antiperspirant. Yes, it’s astonishing, but I really have been using the same one for over a year now (I only put it on when I need it which is definitely not every day). Anyway, after reading about Beth’s baking soda method, I thought I’d give it a go. After all, who doesn’t want to start their day with a pretty little powder puff beneath the arms? I did the 6:1 corn starch to baking soda recipe (mild compared to straight soda) due to my lovely tendency to have allergic skin reactions. I mixed it up in a jam jar and made a puff out of an old sock. Grant and I tried it for the first couple weeks with great success, but this weekend we really put it to the test. We went on a three day backcountry ski trip (read heavy sweating, no showering, and very little in terms of clothes changing). How did we do? Pretty well actually. Did we smell? Yes, of course (we applied deodorant once and then exercised for 3 days. What did you expect?). But we didn’t smell as bad as one might think, and it was definitely no worse than if we had stuck to our usual name-brand, chemical-laden sticks. Sure, it isn’t bulletproof (meaning, it can’t stop me from sweating through my shirt before a public speaking engagement). But then again, almost nothing is. For everyday use, I deem this method more than sufficient. 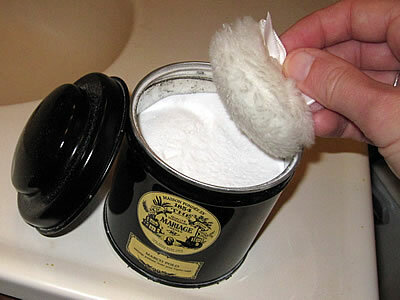 So two thumbs up for homemade deodorant. Cheaper, more natural, and plastic-free. What the heck took me so long? You are onto something. This is a business. lets meet for coffee to discuss it, but remember the deoderant afterall we are in public. Seriously, the deodorant really works!